After a demo here is the first full length album of the Peruvian band, Hell Torment ! Vein of Levifer with their own sound and music, Hell torment offuer us a pure blacking/death sound !MUST BE CHECKED OUT !!!! Roaring from the Brazllian underground, the much awaited debut full length album from ATOMIC ROAR is here. 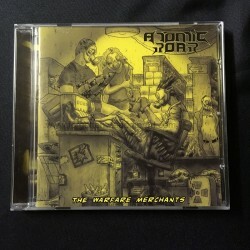 "Warfare Merchants" is a teutonic thrashing punk holocaust which sounds like Lemmy & Tom G. Warrior detonating the nuke. A must for fans of Venom, Motorhead, Slaughter, GBH, NME, etc. Features a Misfits cover. 12 page booklet.